Why does Resilience Code have an interest in high doses of broccoli sprouts and cruciferous vegetables in their diet? Neuroprotection and prevention of many neurodegenerative diseases! A 2013 study suggested sulforaphane could reduce symptoms of Alzheimer’s disease, they can have neuroprotective effects against Parkinson’s disease and traumatic brain injury. One study of mice immediately following a TBI showed memory enhancements using only this powerful antioxidant. Sulphoraphane stimulates the “NRF2” pathway. Nrf-2 is known as "the detox hub" and "core anti-oxidant defense" pathway. It stimulates glutithione and enhances the glucoronidation detox pathway that detoxifies drugs chemicals and toxins. A major sulforaphane benefit is for cancer reduction and prevention. 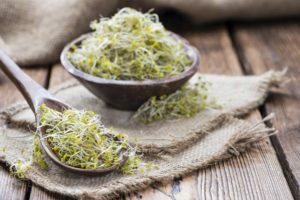 Because of the strong immune boosting and antioxidant properties, sulforaphane can reduce risk of prostate, colorectal, and a host of other cancer types. While the compound may help reduce symptoms after cancer has formed, it is primarily useful for prevention more than anything else. Additionally sulforaphane benefit is for mood disorders. One study showed the NRF2 pathway (mentioned above) has significant impacts on depression. This suggests sulforaphane could help reduce symptoms of depression, though more research is needed to confirm.